When it comes to selecting Sendik’s branded products, we have one rule — it simply has to be top-of-the-line to be labeled with our name. Our imported Italian pasta is an example of the quality our customers expect and deserve. We selected a purveyor from the sunny island of Sardinia, Italy, where some of the best wheat in the world is grown. Couple the careful selection of ingredients with a strong sense of belonging to the land and respect for local traditions and you understand what gives our pasta its outstanding quality. Say hello to Sendik’s Single-Serve Coffee Cups! They are produced for Keurig/K-cup machines and are locally packed in Madison. Enjoy all five of our flavors: Sendik’s Supreme, Neemer’s Hazelnut, Italian Roast, Tudi’s and Decaf Sendik’s Supreme. Your caffeine just got even better! Looking for a snack? 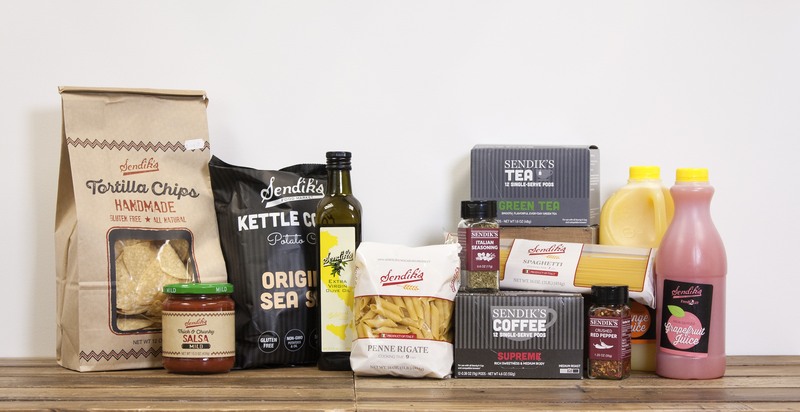 Try our Sendik’s Popcorn or Tortilla Chips! Both are locally made and gluten free! We love working with our local Milwaukee friends to produce our Sendik’s products. It’s why our beer is brewed by the craftsman of Milwaukee Brewing Company, our meats are cured by Usinger’s and our milk is bottled by Kemp’s with product coming from local farmers. We ♥ local. If you haven’t tasted freshly ground peanut butter, we highly recommend it. In our Bayside, Franklin, Hartland, New Berlin, Mequon and Whitefish Bay stores, you may grind your very own. It’s incredibly simple, and incredibly tasty. Honey Roasted is a fan favorite, and Dark Chocolate is a delightfully sweet treat. Organic, natural, and cashew butters are also available. You’ll find many other Sendik’s, top-of-the-line products in various departments throughout the store, including imported olive oil and balsamic vinegar; an entire line of dressings, marinades, dips and ice cream toppings; a full selection of Sendik’s sliced-to-order deli meats, and a wide assortment of nuts and candies.